How sure do you feel about passing the DELE exam? 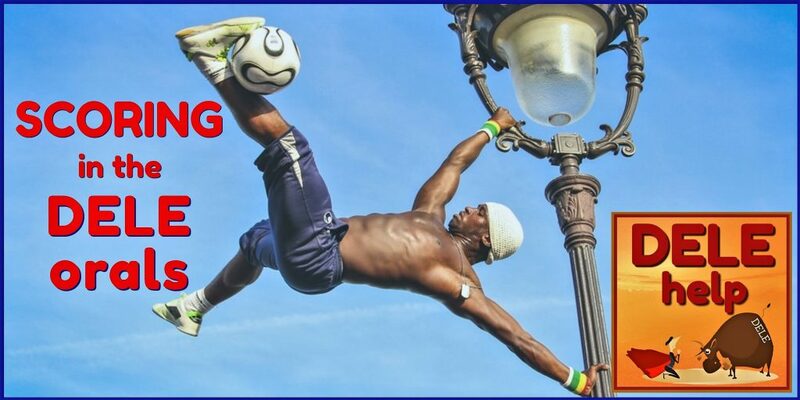 Are you stronger in your reading comprehension than in listening to and understanding the many different Spanish accents? Are you more fluent in speaking, than in writing Spanish? Such variation in strengths may result in you passing one element of the DELE exam, but failing in another. If that is the case, will you still make the overall pass grade? What should you prioritize in your exam prep, to avoid that one element completely trips you up? 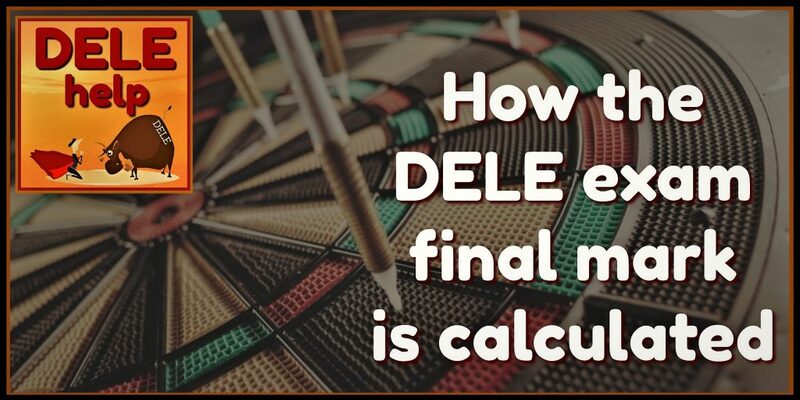 From this, you can see that the way in which the final mark in the different levels of the DELE exam is calculated, is important to how you should focus your personal study plan, when you relate it to your pre-existing strengths and weaknesses. 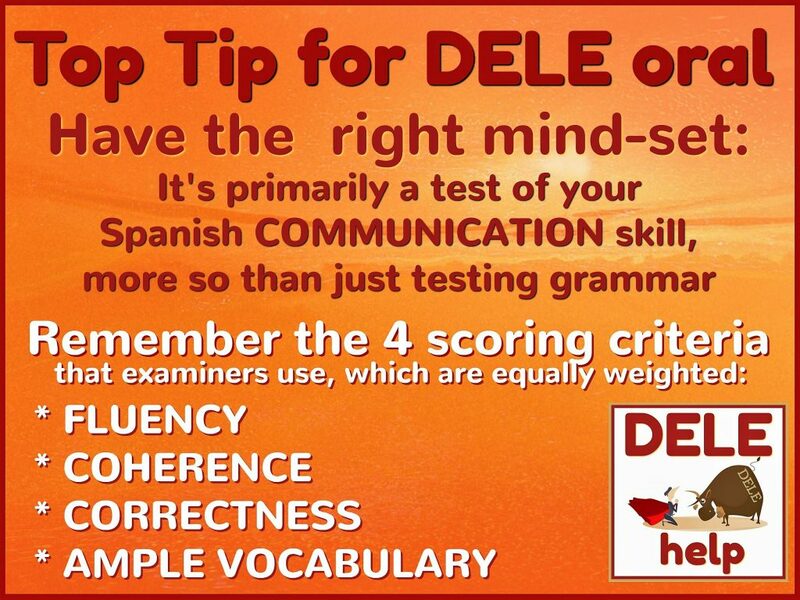 Here we will explain how the DELE exam marking system works at the different levels. 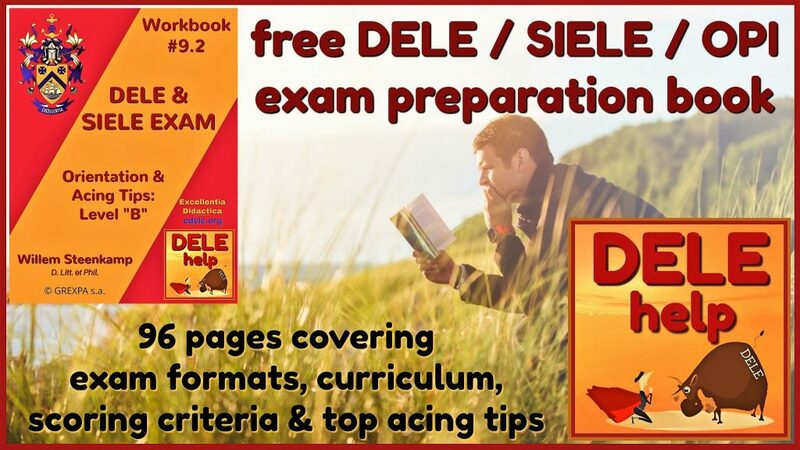 The calculation of the final DELE exam result for levels A1 to B2 – whether you passed or failed – is different from the system used for the top level of the examen DELE, which is level C. In turn, the system used for C1 differs from that for the “mastery” level, C2. 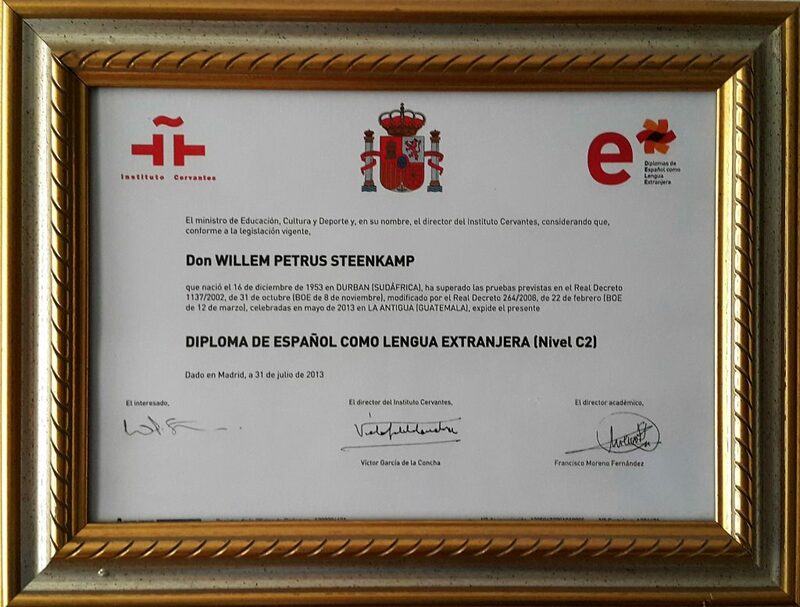 Nonetheless, all the levels have in common that the DELE diploma certifies practical ability to actually communicate fluently, correctly and coherently in Spanish (and not merely possessing abstract knowledge of Spanish). The four areas of communicative competency that gets tested, and which must therefore be developed in your DELE exam preparation, are reading and listening comprehension, as well as proficiency at expression and interaction, both orally and in writing. How each of these four different competencies are individually tested and scored in the different exam sections, is explained in earlier posts in this blog series. You can access these detailed discussions by clicking on the relevant cover image immediately below. They will explain to you the four scoring criteria used (being coherence, fluency, ample vocabulary and correctness) as well as the four numerical bands (0 > 3) in which marks are accorded for each of the scoring criteria. What this present blog post will explain, is how your combined results for these different competencies are in the end aggregated, determining whether you passed or failed. You will see that the four competencies each carry an equal weight, with each making up 25% of the overall exam mark. However, these four competencies are paired, two-by-two, with a required minimum of 60% for each pair (i.e., 30< out of 50). These two legs, in turn, are NOT aggregated – thus NEVER giving you an overall exam score. 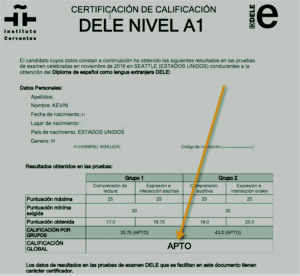 The global mark is simply either APTO (pass) or NO APTO (fail). This is because, if you failed any one of the two pairings, you’ve failed the exam – even should you add up your scores for the two legs and come to an aggregate mark above 60%. YOU HAVE TO PASS BOTH LEGS, to pass the exam and get the DELE diploma. 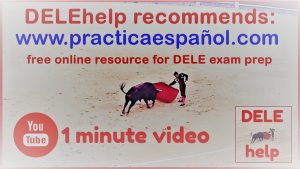 This is particularly important for students who MUST pass (like Sephardic or “Sefardi” descendants who must pass the DELE A2 in order to qualify for Spanish nationality). A more complicated part of the overall pass/fail calculation of the oral expression and of the expression in writing tasks, is how the scoring system for the expression tasks (in four numerical bands i.e., awarding you either a 0, or a 1, 2 or 3 for each of the four scoring criteria) relates to the mathematics of the final calculation out of 25 for each of these two exam parts. Unfortunately, there isn’t one constant, simple mathematical formula used. 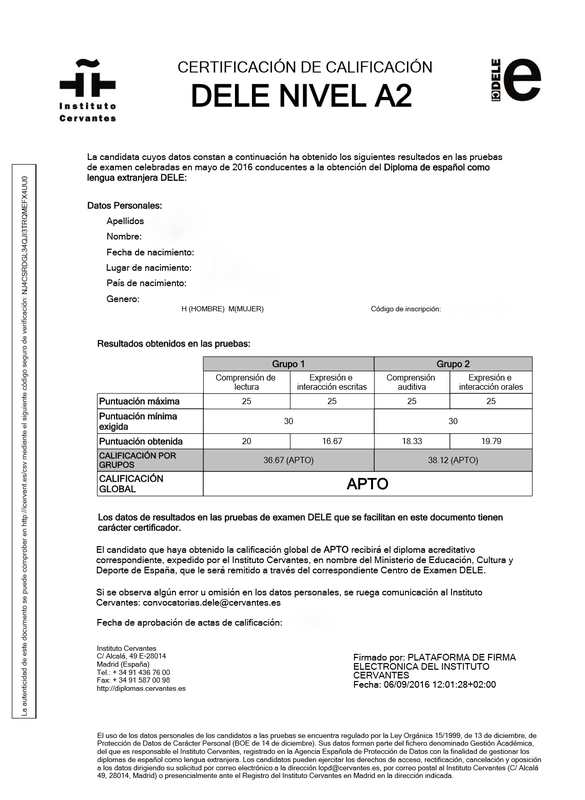 Descripción general Formato de la prueba escrita: La prueba consta de tres tareas: dos de interacción y una de expresión. … Calificación: Se otorga una calificación holística y una calificación analítica a la actuación del candidato en cada una de las tareas. La calificación holística supone un 40 % de la calificación final y la calificación analítica el 60% restante. En la calificación analítica, las tres tareas se ponderan de la siguiente manera: Tarea 1 (17%), Tarea 2 (33%) y Tarea 3 (50%). In brief, there are three tasks to perform in the writing exam. In the analytical assessment task one counts for 17% of the overall mark for this exam segment, task two for 33% and task 3 for 50%. The holistic assessment score makes up 40% of the overall value and the analytical the other 60%. One must thus understand that the weight of the holistic and analytical assessment firstly differs, and secondly that the weight of each task then differs for the purpose of the analytical assessment. How it thus works in practice, is that each task is individually scored for each of the four scoring criteria (coherence, aptness of style/formality, linguistic scope and correctness) i.t.o. the 4 numerical bands, both holistically and analytically. Once that is done for all three tasks, and for both forms of assessment, then the percentage proportions as mentioned, are applied mathematically and the final score out of 25 is thus calculated. Descripción general Formato de la prueba oral: La prueba consta de cuatro tareas: dos de expresión y dos de interacción. Se otorga una única calificación holística a la actuación del candidato en las cuatro tareas y dos calificaciones analíticas: una correspondiente a las tareas monológicas (tareas 1 y 2) y otra a las tareas que integran actividades comunicativas de la lengua de interacción oral (tareas 3 y 4). La calificación holística supone un 40% de la calificación final y la calificación analítica el 60% restante. En la calificación analítica las cuatro tareas se ponderan de la siguiente manera: tareas 1 y 2 (50%), tareas 3 y 4 (50%). The oral part of the exam consists of four tasks. One holistic assessment is done considering all four tasks together. The analytical assessment is split in two: one for the two monologue-type tasks (#1&2) and another for the two interactive tasks (#3&4). The holistic assessment for the oral also counts for 40% of the weight, and the analytical for 60% – with the two segments (1&2 / 3&4) weighted equally at 50% each for the analytical. The four scoring criteria for the oral are the same as for the writing, except that fluency substitutes style/formality. The four numerical bands function the same as in the writing. The mathematical process for calculating the final score out of 25, is essentially the same as I described above for the writing. It is of great importance, i.t.o. adopting an appropriate exam prep study plan as well as for having the right mind-set when going into the actual exam, that you understand how the two exam parts testing your competency at expressing yourself orally and in writing, are scored i.t.o. the four scoring criteria used. This is actually of much more significance than the mere mathematics of calculating the final pass/fail, discussed just now. Please, therefore, click on the banner images of the two blog posts shown above, to go and acquaint yourself with what these scoring criteria are and how they are applied. The system employed for calculating a pass or fail for DELE C1 still very much resembles that for A1 – B2. It has the four competencies, also grouped in two pairs. The main addition is that the element of integrated dexterity in language use is being emphasized much more than at the lower levels. Instead of just testing reading and listening comprehension, DELE level C1 combines this with testing competency at the use of language. Similarly, oral and written expression is integrated with comprehension (what this means, is that your answers – when you express yourself – need to reflect how well you understood the texts and audio clips upon which the written and oral expression and interaction tasks are based). The principles for arriving at an overall pass / fail determination remains the same as for A1 – B2, though. You have to obtain 60% per pair, for each of the two pairs. 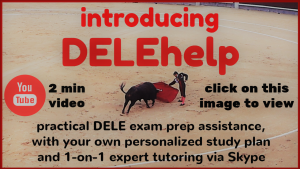 Watch 2 minute video introducing DELEhelp’s exam prep services. The difference with the lower levels is that, instead of passing two pairs, you have to pass each competency tested (for A1 – B2 you could fail one competency, because if your showing in the other competency paired with it was strong enough to give you a pass aggregate for that paired group, you still passed). In the case of the three sections of the C2 exam, you have to pass each one individually. You will notice that there’s also much more focus on integrated dexterities (i.e., application skills). It is still essentially the same four core communicative competencies that gets tested, just configured into three sections in a more synergized, cross-impacting way, resembling the integrated nature of real-world interactive language use. This is what the DELE Diploma looks like. Talking about exam results – at DELEhelp we are fortunate that our regular students always do well in their exams. I’ll quote you what two of these students wrote us. The first underlines the need for a proper study plan and focused tutoring for obtaining success. The second shows how flexible our 1-on-1, personalized Skype tutoring can be, fitting in with a globe-trotting student’s travels across continets and time zones. KEVIN wrote about how he changed his fortunes from having failed on his own, to passing with us at his next try, getting 100% for his oral: My family and I vacation frequently in Baja California and I have always found it rather easy to get by speaking very little or no Spanish. Most locals I encounter in Baja are patient and usually speak a fair amount of English. However, over the last several years, I have developed a great fondness for Mexico along with its people and culture and this fondness lead me to believe that I have been missing a great deal by remaining in an English-only world. For this reason, I finally promised myself to learn to speak Spanish. 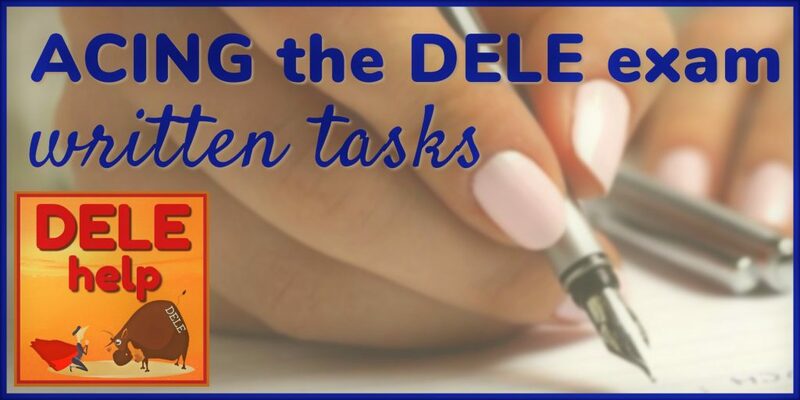 At the same time, I wanted an objective and concrete way to measure my progress and chose to employ the DELE exams for this purpose. My first experience with the exam preparation process did not go so well. After reading a bit about the exam and the various levels I decided I would prepare for a few months and then sit for the A2 exam. This seemed reasonable to me at the time since, after all, I had some Spanish in elementary school and even practiced a bit as an adult with audio tapes. I was not a complete beginner! So, for a few months I studied when I could find the time and practiced online a bit with native speakers. When exam time came around, I did my best and actually enjoyed the exam experience, but, the test was much different than I had anticipated and it I was clearly far from the mark regarding A2-level Spanish. The test results confirmed my assessment and I failed pretty miserably on all four test sections. I felt sorry for myself but quickly realized that I just needed a better learning approach. I also now knew that success would require this approach to be more disciplined, formal and structured. Fortunately for me, the day of my tragic exam experience I met two other, better prepared, test-takers and they told me about their very positive test prep experience using a plan developed for them by the folks at DELEhelp. I enlisted the DELEhelp team within a week. After an initial conversation, I was given a series of tests much like the DELE exam. The results of this test indicated that my current Spanish level was well below A2 and that I should target the A1 level for my next exam. It was then explained to me, very clearly, what is expected of a person communicating in Spanish at the A1 level. With this target in mind and my test results in hand we created a study plan to get me to the A1 level in all categories. In my case I was strongest in reading and writing, so listening and speaking would be emphasized. Together we chose an exam date and got to work. My study plan consisted of reading and writing assignments, vocabulary memorization (a necessary evil), Spanish media in various forms that I selected and also live Skype sessions in Spanish. The Skype sessions were used to review and discuss assignments, test vocabulary and talk about events within the media segments. Periodic mock tests were provided and the study plan was tuned accordingly. For instance, halfway through my A1 prep course it became clear that I needed more conversational practice and also that we could afford to lighten the reading and writing load. This combination of homework and independent study, along with live review in Spanish with a native speaker, worked wonders for me. I felt quite confident heading into the exam. When I received my test results I had a bit of a surprise waiting. I had comfortably passed the reading, writing and listening sections of the exam but I was a bit shocked to find that I had received a perfect score on the oral section (25/25). My smile muscles severely cramped after an hour or so of constant use. Even more fun for me was a trip that my family and I took to Costa Rica a few weeks after the exam. I found myself talking to people I had never met before, in Spanish! I was introducing my family, describing our adventures and asking questions about the food, their families and their country. They were talking back to me in Spanish and smiling warmly when I mixed up words or made other, sometimes very funny, mistakes. It is very hard to describe this experience but it was amazing. I know that I am only at the A1 level but I am very solid at this level. I also now understand that I can continue as far as I want down this path if I am only willing to follow an effective plan and put in the effort required. I can be as fluent as I want to be. It’s hard work but it is not magic and it is well worth every minute. ALEX from England, who prepped with us whilst exploring the jungles, mountains and beaches of the length and breadth of the Americas and finally wrote her DELE exam in New Zealand, wrote: Working with Willem and Monica was extremely valuable in my preparations for the DELE B2 exam. I was travelling at the time and they were able to be flexible and work with different time zones and my availability. 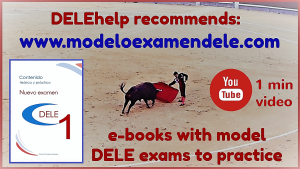 They tailor the content of the lessons to what the particular student is looking for and to the syllabus of the DELE exam. Having gone through multiple mock exams with Monica, I felt more prepared and confident in tackling the format of the exam on the day. They are truly wonderful people and they made the lessons enjoyable as well as effective in improving my Spanish. 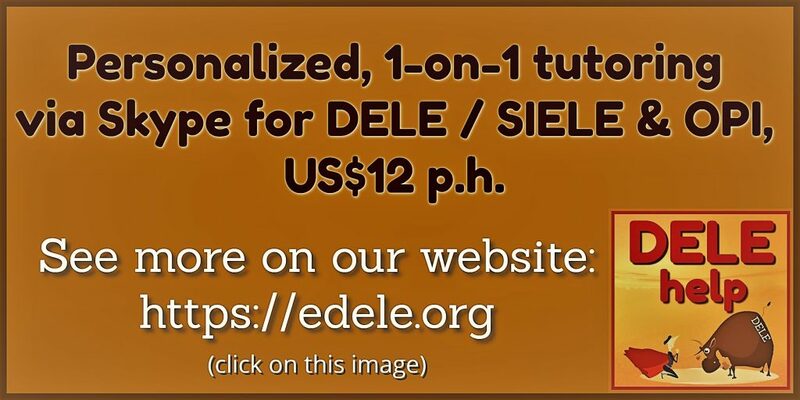 An important element in our students’ success has been the use of top DELE exam preparation resources. We have selected the most important ones (mostly free), and made short 1-minute videos of recommendation. You can access these by clicking on the images below. – Also, I wanted to ask for some help. I just finished the first test of the C1 book (actually planning to try out the C2 exam in Lima, Peru may 20th btw) about reading comprehension, scoring 27 correct answers out of the 40 questions. I can’t seem to find information about where that leaves me in the book though?? Thus, is it correct to calculate like this: 40 questions with a total value of 25 points –> 25 / 40 = 0,625 (is then the value of a single question). So, with 27 correct answers 27 X 0.625 = 16.875 (the points obtained in the first quarter of the exam. Correct? Thanks for your nice words about our blog. For the C1 exam, the reading comprehension section is grouped with the written expression section, and you must obtain an aggregate score of 60% for the two sections together, to pass the combined reading/writing component (the same applies to the other two sections, and you then have to have an apto for each of the two aggregated components – i.e., reading/writing and listening/speaking – in order to pass the exam as such). Since your score in the reading comprehension section that you did was 67.5%, that would set you up well for a pass of the reading/writing component, depending on what you would score in the written expression. The problem many students encounter with their self-study preparation for the DELE exam, is that they can easily see how well they have done with the mock multiple choice comprehension questions (by simply consulting the claves). What they cannot know, is how their written and oral expression would rate, for which engaging with a qualified tutor would be required, so that the tutor can evaluate and provide you with feedback and expert guidance. In addition to the free workbook, we also offer a free, one-hour exploratory Skype tutorial session, without any obligation. If you want to make use of this, just send me an e-mail with your preferred date/time, so that I can set it up. All the best with your DELE exam prep. Hi I really don’t understand my DELE practice reading paper at all. It is level A2/B1 but the questions make no sense. Can you perhaps describe how I can answer them and leave a mark scheme aswell so I know how to leave my answers? Thank you!